Peru is a city in, and the county seat of, Miami County, Indiana, United States. Get out of town with these interesting Peru side-trips: Seiberling Mansion (in Kokomo), The Village at Winona (in Winona Lake) and Marion (Marion's Mississinewa Riverwalk, Marion National Cemetery, & more). There's lots more to do: hike along Nickel Plate Trail, get engrossed in the history at Wabash County Historical Museum, examine the collection at American Huey 369 Museum, and contemplate the waterfront views at Lake Michigan. To find ratings, reviews, photos, and other tourist information, read Peru trip itinerary website . Fort Wayne to Peru is an approximately 1.5-hour car ride. In June, daytime highs in Peru are 81°F, while nighttime lows are 62°F. Cap off your sightseeing on the 1st (Mon) early enough to travel to Yellowstone National Park. Step out of Yellowstone National Park to go to Gardiner and see Horseback Riding Tours, which is approximately 1h 15 min away. Spend the 4th (Thu) surrounded by wildlife at Grand Teton. Spend the 13th (Sat) exploring nature at Fairy Falls. 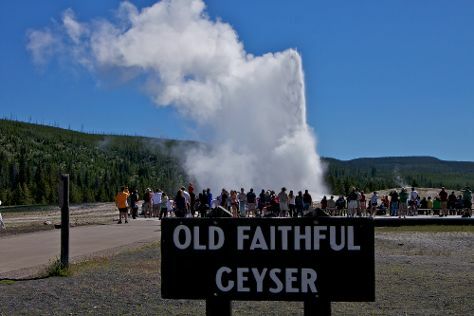 There's still lots to do: take in the natural beauty of Old Faithful, look for all kinds of wild species at Hayden Valley, contemplate the waterfront views at Yellowstone Lake, and explore the wealth of natural beauty at Mount Washburn. To see other places to visit, where to stay, reviews, and tourist information, read Yellowstone National Park day trip planning tool . The Route module can help you plan travel from Peru to Yellowstone National Park. Traveling from Peru to Yellowstone National Park, you'll gain 2 hours due to the time zone difference. Traveling from Peru in July, expect nights in Yellowstone National Park to be colder, around 39°F, while days are little chillier, around 73°F. On the 14th (Sun), wrap the sightseeing up by early afternoon so you can travel back home.